Nate Sudfeld entered the Eagles’ playoff-clinching 24-0 win over Washington yesterday after Nick Foles got hurt and threw just one pass. 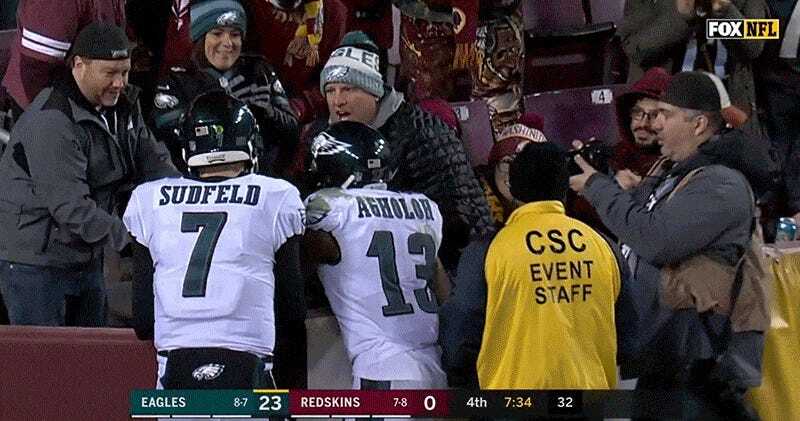 It was a 22-yard TD toss to Nelson Agholor, the first touchdown throw of Sudfeld’s career. After scoring, Agholor promptly gave the ball to a kid in the front row wearing a Nick Foles jersey. Whoops! That was Sudfeld’s first NFL touchdown pass. He wanted that ball. And he’d get it back. Fortunately for the kid, he got that other football—and some television airtime!